In physics, parity is the quantum-mechanical operation which reverses the signs of the coordinate axes being used to describe a system. It has no significance in classical physics, but essentially arises from the symmetry of space. Parity (P) is equivalent to a mirror reflection followed by a rotation through 180°. The parity is 1 (or even) if the wavefunction of the system is unchanged by an inversion (reflection in the origin) of the coordinate system; it is -1 (or odd) if the wave function is changed only in sign. Parity is a constant in strong and electrodynamic interactions and does not change with time because these interactions are governed by physical laws which do not distinguish between a right- or a left-handed coordinate system. Parity is, however, violated in the weak interaction; that is, an object of positive parity can change with time into an object of negative parity, and vice versa. See also CPT theorem and CP violation. 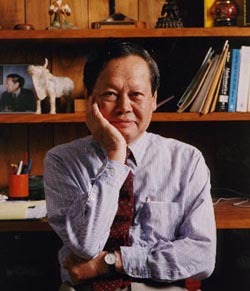 Chen Ning Yanh is a Chinese-born American physicist who shared with Tsung Dao Lee the 1957 Nobel Prize in Physics for their studies of violations of the conservation of parity. Yang and Lee studied the decay of K-mesons (see meson), which seemed to break down in two different ways, and in 1956 they concluded that in these weak interactions parity need not be conserved. 1. The sum of the digits in a binary representation of a number. 2. An indication of whether two numbers are both even or both odd (same parity), or are such that one is even and one is odd (opposite parity). This concept, of same or opposite polarity, can be applied to any things that can have two different states – the sense in which a knot is tied, the color of a chessboard square, and so on.